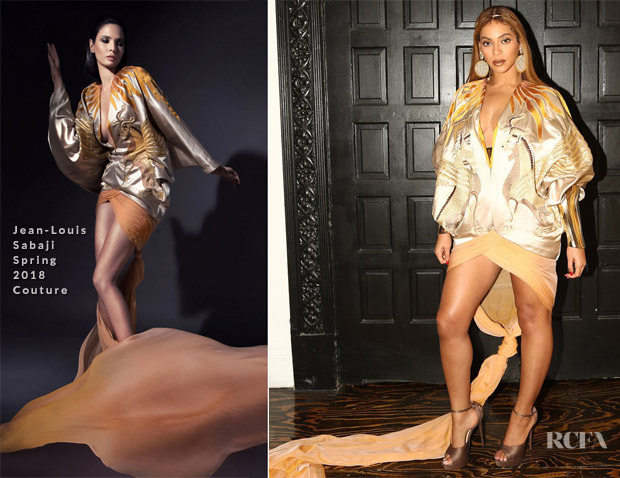 Following her red carpet look, Beyonce Knowles changed into a seat friendly dress for the Wearable Art Gala on Saturday (March 17). Continuing the same golden Nubian warrior theme, this Jean-Louis Sabaji Spring 2018 Couture look didn’t have the same gravitas as the first; even with the addition of the gold metal hand guards, as it still feels like an oversized bomber jacket. I think the train is bothering me the most, as it doesn’t appear to serve any real purpose.